The Duchess of Sussex, who is six months pregnant, stunned in a black Oscar de la Renta dress. The 37-year-old wrapped up warm in a vintage William coat and khaki boots. As they arrived, Meghan and Harry greeted royal fans who have braved the snow to catch a glimpse of the couple. 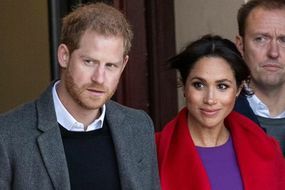 Meghan and Harry’s first engagement is a visit to the Bristol Old Vic theatre.